The Chainstitch Script Alphabet in upper case finishes this week with the letter Z, available free in 4" size til 25 April 2019. The new lower case version begins next week! This lovely chain stitch script was inspired by the hand-embroidered lettering my Mom used to sew names on our Christmas stockings when I was a kid. For best results, you might want to stitch this font with a slightly heavier sewing thread (30 wt). The font is free in 4" size, including both upper case and lower case letters, but you can purchase it in smaller sizes if you wish. 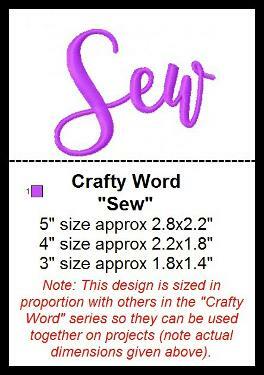 This week's freebie in 4" size begins a new Crafty Words series. 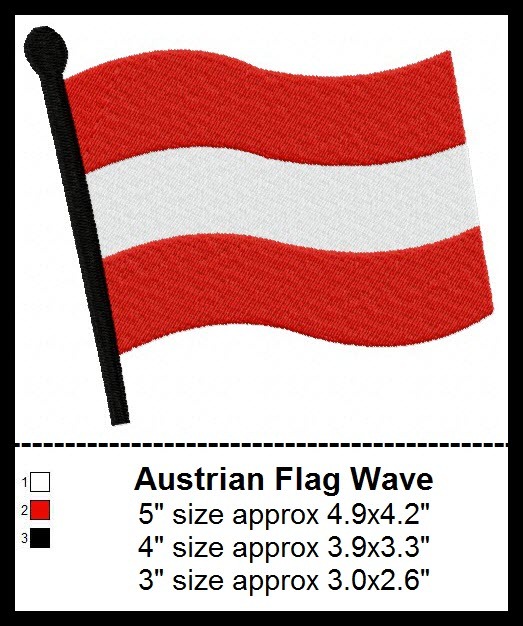 Great for tees, quilts, bags, and more. 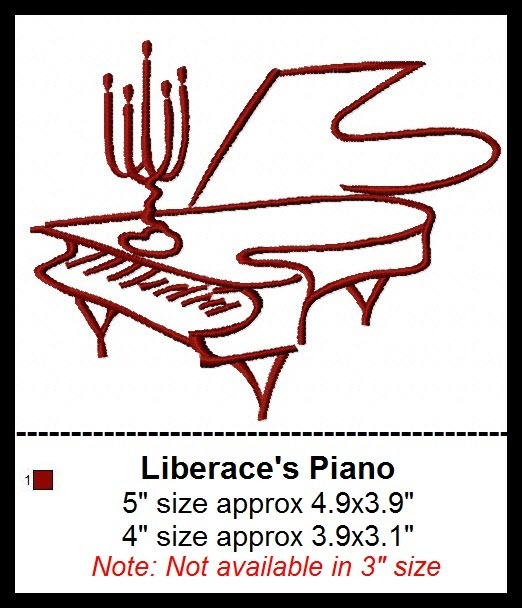 The words in this series are sized so they can be used in combination on projects, so some of the shorter words are actually slightly smaller than their nominal size -- that is, the 4" size is actually only 2.2" long. 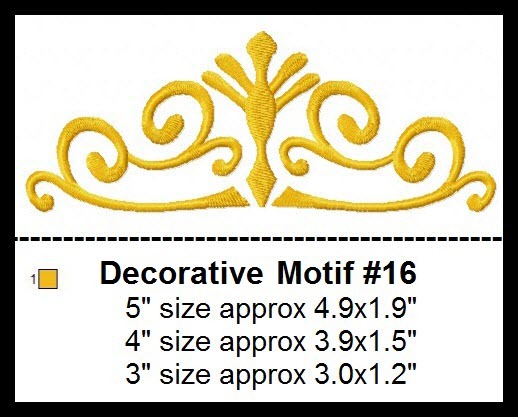 Check out another new design added to the Decorative Motifs collection! 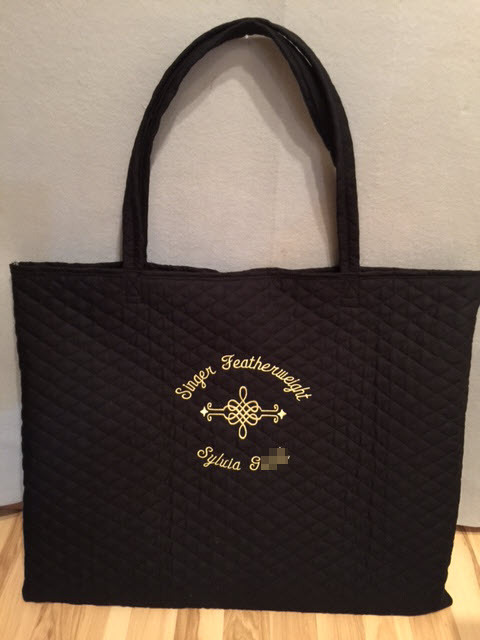 This one isn't a vintage sewing machne decal, but it sure does look good stitched on bags and machine coversalong with the Singer name design. This one's a bit of a departure for me, but was amazed all over again when I watched some clips from the 1950s of Mr. Showmanship playing the piano. I was also captivated by his flamboyant signature and the sketch that accompanied it. Find both on the Playing Around page. I spent a large part of the week servicing motors on my Singer 400-series machines (401, 403, 414, and 411G). I was doing well until I accidentally dropped the motor from the 403 and shattered the bakelite casing. Now I'm busy scrounging a donor motor from a non-working machine, because I really want to keep this one running. These are really very robust machines -- the last of the great mechanicals that were "over-engineered" for household use, and the last of the all-metal Singers. If you're interested, here's a really good video (not mine) that details how they were built and how they compare to the 301. 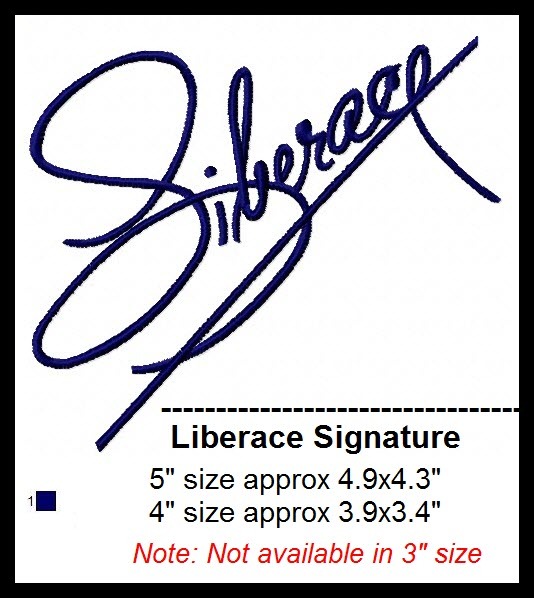 Liberace would be turning 100 years old this year if he were still around. I was reminded of just how much fun he was to watch, and how hugely popular his TV show was back in the 1950s, when I happened across this clip on youtube while searching for something else. This has to count as one of the earliest music videos, and it's great fun. If it piques your interest, check out some more clips from the TV show and see this amazing performer playing his special blend of classical and popular music. 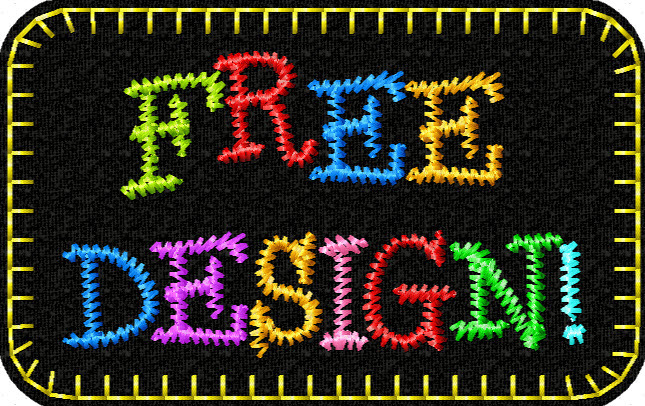 The lower case Chainstitch Alphabet freebies begin next week with the letter "a". They're actually slightly smaller than 4" because sized in proportion to the upper case letters, so that they can be stitched together. I've been doing some revision site-wide, an arduous process that includes moving some files around. Because there are so many, I may inadvertently have broken some links. If you happen to notice any missing images, I'd love to hear about them. Just let me know which pages seem to be missing images and I'll make the repairs. Because the site uses an unconventional ordering process, I get a lot of queries about why I don't have a proper on-line store. If you're confused about the ordering process and would like more information, there are instructions here; if you're curious about why it's set up the way it is, you can read a bit of the history at length here. There's been a recent increase in e-mail glitches, meaning that attachments are being blocked -- I suppose as a result of tightening security measures. For this reason I have been sending more designs via Hightail, so if you have ordered from me you may receive my e-mail message via them, including a download link. If you receive my message via Hightail, just scroll to the bottom of the page and click on the orange button that says "View All Files". you'll be taken to a page that displays my message on the left and another orange "Download" button on the upper right. And always, if you have ordered some designs and have not had a response me within 24 hours, it means there's a glitch somewhere, so please please LET ME KNOW! If I don't hear from you I won't know that my message didn't make it through, so please just send a quick e-mail to say you didn't get the designs, and I will make it right or issue a refund. If you've ever had an issue with "birds' nesting" at the beginning of a line of stitching, try the simple tip shown in this video from Hoop Sisters. If you have a multi-needle machine, you can still use this idea, as Melissa from Little Bee Designs demonstrates. Her video is actually about something else, so you need to forward to 12:06 to find the tip, but it's worth doing because the demo is very good. I also added some additional detail to my discussion of "retrobritening" the plastic housings on vintage 70s machines and have relocated this information to Jen's Projects page. I just completed brightening three of my machines and am delighted with how much better they look!! If you have a JPG or PNG image that you need to convert to SVG for some of the electronic cutting machines, you could try a free online file converter such as this one. I haven't used it myself yet so can't vouch for the quality but it's worth a try. There are others as well -- just search "free online SVG converter" and you'll find a host of them to choose from. When sending me your list of designs, please be sure to state the name of the design you want exactly as it appears on the site, in order to avoid confusion when I'm filling your order. Because these are electronic products, I won't be able to replace a design if I send the wrong one because the name was incorrectly stated. If you haven't had a look at this video from Steve Carmichael about DIY one-color screen printing for T-shirts and bags, you might want to give it a view. It's a fun project idea and very clearly presented. If you've been wanting to try your hand at printing on fabric with your laser printer, here's an intriguing video from Lisa Capen that you might enjoy. I'm hoping to try this one myself soon and will let you know how it works out. It's always Christmas crafting time around my place, and speaking of Christmas, here's a link you might want to check out if you enjoy crafting hand-made ornaments as much as I do. It's got lots of DIY ornament ideas that can be personalized to your interests and needs. 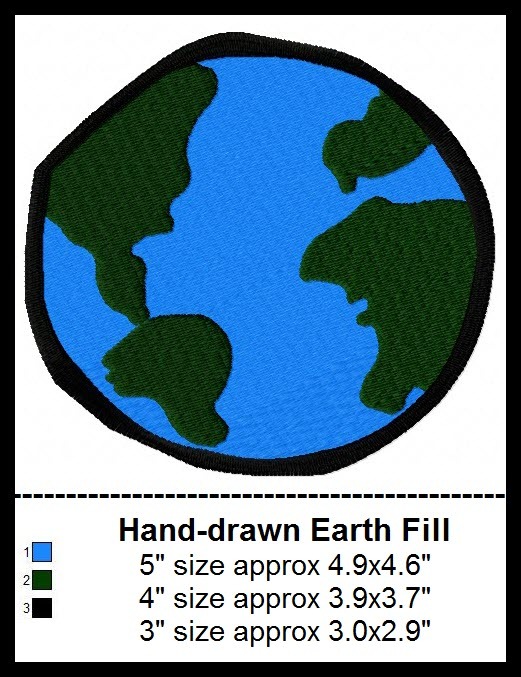 Check out the FAQ page for a short piece on using plastic as stabilizer for small embroidery projects. Find it partway down from the top of the page. Did you know? This site contains no advertising and has no affiliations with any other site. I do not track visitors and I do not share personal information from correspondents. The only revenue I receive is from small purchases or from occasional donations -- which by the way are always very gratefully received. In response to a few recent queries, I've created some decal images for use with cutting machines such as Brother's Scan & Cut. I don't expect to do much of this work as I don't have a really good graphics program, but thought I would experiment with the most popular ones. If you'd like to acquire these images without the grey "sample" overlay please enquire. Cost will be $2 apiece for jpg or png images. 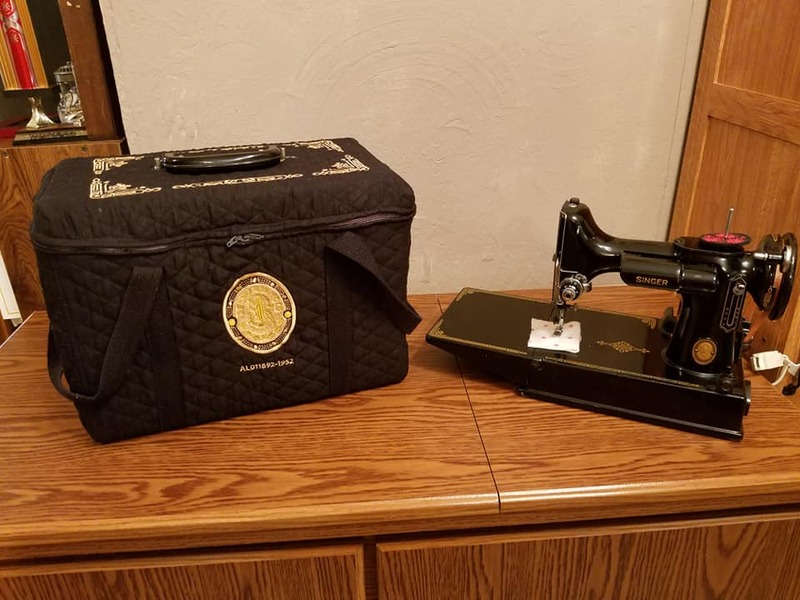 Interested in making one of the lovely sewing machine totes and cases that are all the rage on line? 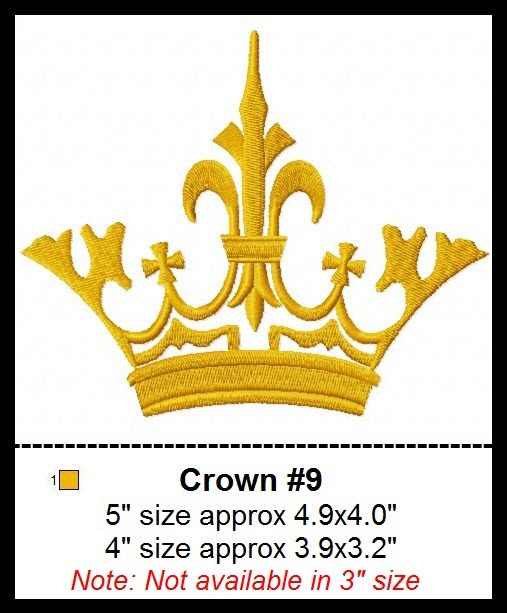 They come in a variety of styles, but all look great in plain black with vintage decal designs stitched in gold! Find all manner of decals at this link, or grab the same set that Andrea and Cheryl used for their projects. On that same page, you'll also find links to on-line sources for patterns and instructions. Andrea made the slipcover shown above; the tote at left was created by Sylvia, while Cheryl sent in the picture below. 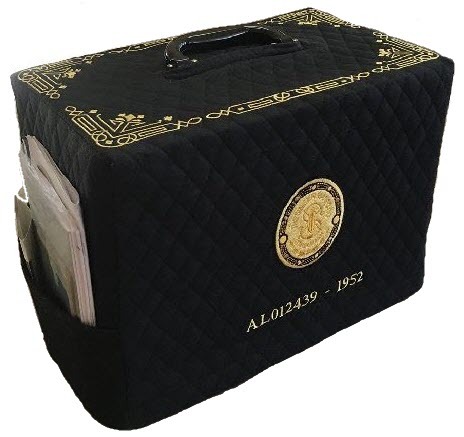 You can find many more images to spark your imagination if you search "Featherweight Case Covers" on line. Check the bottom of each site page to find additional freebies, or click here to find some Potter-related free designs! Look for more freebies throughout the site!